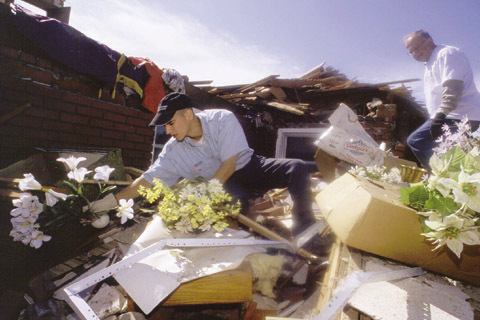 Shane Zavala of Building Systems Maintenance picks up flowers at the Hallam United Methodist Church, one of many buildings in that town destroyed by the May 22 tornado. At right is Ed Schmidt, associate dean of the College of Arts and Sciences. Zavala and Schmidt were two of hundreds of UNL employees who helped at the tornado sites May 26-28. Photo by Brett Hampton. Even five days after the event, when busloads of volunteers from UNL drove into the southern Lancaster County town of Hallam, there was no mistaking the magnitude of the damage left by the tornados that hit on May 22. Huge silos were twisted, their contents spilled on the ground. Houses were left as empty shells, caved in or blown away with only a few standing walls left. A huge amount of litter from houses and what were once large, mature trees covered lawns, with personal items, appliances and the other material pieces of peoples lives mixed in. The University of Nebraska Board of Regents on May 22 selected James J.B. Milliken as president of the NU system. He begins his duties Aug. 1. Barbara Couture, dean of the College of Liberal Arts at Washington State University in Pullman, has been named senior vice chancellor for academic affairs at UNL. Chancellor Harvey Perlman made the announcement May 14. UNL offices will be closed and classes are canceled on June 11 for a National Day of Mourning for the death of former President Ronald Reagan. This notice was sent to vice chancellors, deans, directors and department heads from Chancellor Harvey Perlman on May 10. The second Nebraska Summer Writers Conference will bring 16 literary experts to UNL this month to work with about 200 writers from more than 25 states. One step closer in the search for the holy grail: Thats how Greg Snow and Dan Claes describe their field, high-energy physics, with the publication this week of the surprisingly large mass of the top quark. UNL and the Homestead National Monument of America in Beatrice announced plans May 24 to preserve important homesteading records from the Broken Bow area. In 15 years of traveling the world as a photographer for National Geographic magazine, Joel Sartore has been up close and personal with some of the globes wildest places. A dedication ceremony for the Sheldon Memorial Art Gallerys newest outdoor sculpture, Breach, will begin at 4 p.m. June 15 and is open to the public. The dedication will be followed by a picnic supper under the sculpture at 5 p.m. Attendees will be able to meet the works creator, New York artist Roxy Paine. The evening will also include live music and a silent auction. UNL Theatres Nebraska Repertory Theatre continues its 37th season this month. Presented in rotating repertory are Anne Nelsons story surrounding the World Trade Center tragedy, The Guys, and Ken Ludwigs comedy Lend Me a Tenor. Both productions are in the Howell Theatre, first floor of the Temple Building. Three concerts remain in the annual Jazz in June series offered at the Sheldon Memorial Art Gallerys Sculpture Garden. Sixteen log-cabin quilts will be featured in Design Dynamics of Log Cabin Quilts: Selections from the Jonathan Holstein Collection, an exhibition sponsored by the International Quilt Study Center at UNL in the Robert Hillestad Textiles Gallery through Aug. 31. Movies on the Green will provide cinematic entertainment on summer evenings on the UNL City Campus. These movies will show June 11-24 at the Mary Riepma Ross Media Arts Center. For show times and more information, call 472-5353 or visit www.theross.org.